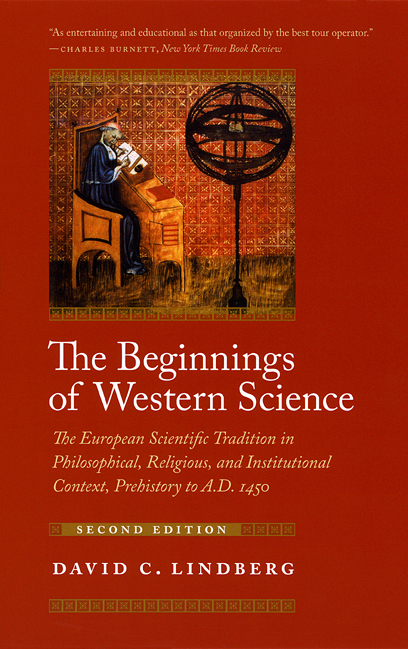 When it was first published in 1992, The Beginnings of Western Science was lauded as the first successful attempt ever to present a unified account of both ancient and medieval science in a single volume. Chronicling the development of scientific ideas, practices, and institutions from pre-Socratic Greek philosophy to late-Medieval scholasticism, David C. Lindberg surveyed all the most important themes in the history of science, including developments in cosmology, astronomy, mechanics, optics, alchemy, natural history, and medicine. In addition, he offered an illuminating account of the transmission of Greek science to medieval Islam and subsequently to medieval Europe. The Beginnings of Western Science was, and remains, a landmark in the history of science, shaping the way students and scholars understand these critically formative periods of scientific development. It reemerges here in a second edition that includes revisions on nearly every page, as well as several sections that have been completely rewritten. For example, the section on Islamic science has been thoroughly retooled to reveal the magnitude and sophistication of medieval Muslim scientific achievement. And the book now reflects a sharper awareness of the importance of Mesopotamian science for the development of Greek astronomy. In all, the second edition of The Beginnings of Western Science captures the current state of our understanding of more than two millennia of science and promises to continue to inspire both students and general readers. "The value of Lindberg’s book as an introductory text for students is clear, but it will also serve as an excellent resource for non-specialists, particularly those teaching comprehensive survey courses. . . . [The book] offers a concise, highly accessible introduction to the essential elements of western knowledge about the natural world that will help guide instructors in developing curricula. . . . The possibilities presented to enrich and enliven a general history course abound.. . . . This second edition of The Beginnings of Western Science will remain a fundamental and reliable resource for many years to come." "This is a fine book, the culmination of a century of distinguished research on premodern European science. And it tells an important story that . . . needs to be read not only by undergraduates but by professional historians and anyone seeking to understand the origins of modern science."